My wife and I have decided to move from Cincinnati to Chicago and the moving day is quickly approaching. I was hoping to get one more flight in before leaving but based on the current weather forecast it doesn't look like it will happen. I will miss flying over Cincinnati and in and out of such great airports as Lunken and Blue Ash. I will also really miss being able to drive or fly to Sporty's Pilot Shop at the Clermont Country Airport. Anyone looking to learn to fly in Cincinnati should check out Co-Op Aviation based out of the Blue Ash Airport. Although I will miss flying in the Cincinnati area I am really looking forward to new flying experiences in the Chicago area and in Wisconsin. 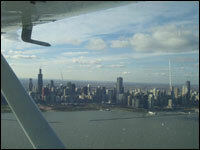 You can't go wrong with having the Chicago Skyline as a backdrop for your flying experiences. I plan on posting a message on StudentPilot.com to find suggestions for great airports in the area. If you know of a great Fixed Based Operator(FBO) or airport let me know. I will need to spend some time working with an instructor in Chicago getting comfortable flying in a higher trafficked airspace and being so close to an airport as busy as O'Hare. I moved to Downtown Chicago about 4 years ago, and have been flying out of Chicago Midway (MDW) for most of the time. I've also flown / rented from West Chicago (DPA), Schaumburg (06C), and Palwaukee (PWK). I'd be happy to share my experiences. You'll love the challenge of Chicago's airspaces -- it really puts a premium on your radio and see-and-avoid skills (VFR, obviously). I learned to fly out of Midway and frankly, I feel a lot safer working in their Charlie airspace than I do out on the Classe E fringes of O'Hare's B space. There are still a lot of cowboys out there and you need to keep a sharp eye peeled for them. Schaumburg's airport has a good FBO with Northwest Aviation; they fly a variety of Cessnas and Diamonds. (I'm checking out on an Eclipse next week -- looking forward to it.) I've also heard great things about Windy City Flyers out of Palwaukee, but I've never flown there myself. Midway's two rental outfits offer mostly older Cessna equipment, but I'd put in a good word for Bill Schreiber at Aviation Professionals -- he's a first-rate owner/operator, pilot advocate, and Midway booster. I've been checking out in the 4 seat, steam gauge, DA-40 Diamond Star... They also have a glass panel DA-40. Their 2 seat Diamond Eclipse looks like fun. Thanks for the tips guys! I am making the move this weekend. Once I get settled in I will check out some of the suggested FBOs and be in touch. Welcome to Chicago. I have really enjoyed reading about your flight training. I have flown out of Midway, Schaumburg, and Palwaukee (as a student pilot or tagging along for the ride). One thing I was surprised by was how easily you can get in and out of Midway. I look forward to reading about your flying adventures now in Chicago.